Nordic Textile Art is a network for all Nordic textile artists interested in participating and creating a textile powerhouse, and to those who want to follow the textile based art at its cutting edge. The objective of the organization is to be a forum connecting and creating new networks and meeting-points for Nordic textile art. Nordic Textile Art wants to make it possible for people to meet in person, as well as contributing to virtual meetings, where the core of the network is its members. Together we promote the development of Nordic textile art. Northern cooperation and the interest of the Nordic textile art is what creates the foundation of NTA. Nordic Textile Art wants to give you an insight to what is happening within the nordic textile art. The website is one of our meeting points. NTA Gallery, is the virtual exhibition space of Nordic Textile Art showing textile art from the Nordic countries. 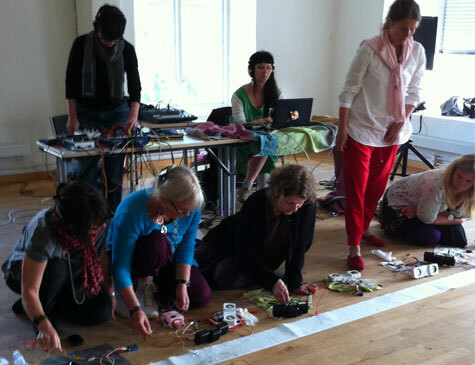 Nordic Textile Art arranges networking meetings, dialogues, lectures, seminars and workshops. NTA is aiming at arranging exhibitions of Nordic textile art in cooperation with other organisations. NTA is building a large network for textile art in the Nordic countries as well as looking further out into the world through ETN, European Textile Network. A close collaborator is the Textile Museum of Sweden, Textilmuseet, in Borås. The organization is deeply rooted in the North and because of that it is able to create a platform for textile art locally, nationally as well as internationally. The organization is working in order to advance and promote textile art for individual artists and art organizations, as well as for art hierarchical/political purposes. Vill du ha information om NTA på svenska, klicka här. Hvis du ønsker informasjon om NTA på norsk, klikk her. Hvis du vil have information om NTA på dansk, klik her. Haluatko tietoa NTA suomeksi, klikkaa tästä. Viltu upplýsingar um NTA í íslensku, smelltu hér.